Love the look of today’s straight hairstyles, but hate all the hassle of styling your hair? The Infiniti by Conair 1875 Watt Professional Nano Silver Tourmaline Ceramic Styler from Today’s Concept can give you the luscious locks you crave in a fraction of the time. 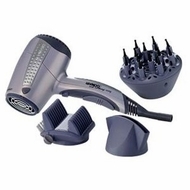 This styler comes with separate diffuser and concentrator attachments. An addition 2X straightening attachment makes silky smooth hair a breeze. In addition, ionic technology gives your hair the shine usually reserved for trips to expensive hair salons. Don’t spend more than you have to on fancy styling tools. The Infiniti by Conair 1875 Watt Professional Nano Silver Tourmaline Ceramic Styler give you everything you need for a great look every day!